Injured at work? Call Cummings & Middlebrooks, LLP today. As an injured worker, there are probably countless questions running through your mind at this time. You could have concerns about how to pay for your medical bills. You may be worried about your recovery time and getting back to work. In some instances, you may be anxious about not being able to return to work due to the serious nature of your injury or debilitation. In all of these instances, sharing your concerns with a knowledgeable and compassionate workers’ compensation attorney can help put you on the best path toward an adequate financial recovery so you can take back control of your life. 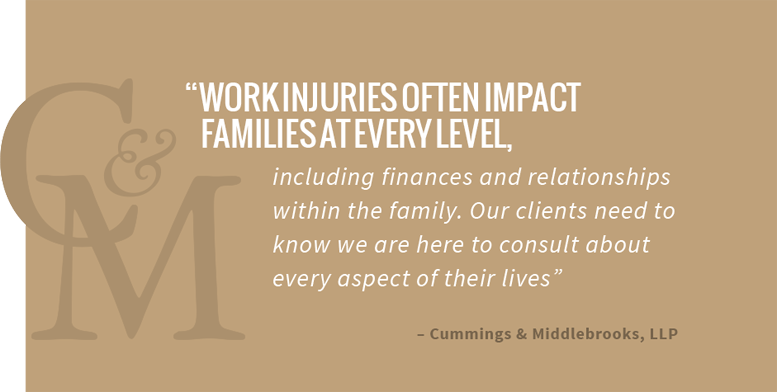 Contact Cummings & Middlebrooks, LLP today to learn how our Atlanta workers’ compensation lawyers can help you. initial consultation at no cost or risk to you. We understand you may be unsure of your rights or options after a work-related accident Let us help address any of your questions or concerns. As an injured worker, you could be entitled to receive benefits to compensate for your lost wages, medical bills, and other damages. Our attorney has earned an AV® Rating by Martindale-Hubbell®, indicating the highest rating for ethical practices and trial abilities. Request a consultation with our team by filling out the form or by calling (404) 250-3292. At Cummings & Middlebrooks, LLP, we are committed to helping injured workers secure their rightful benefits. Though we began our practice working on behalf of major insurance companies, we now use our past corporate experience for the individuals who need it. Bottom line: our lawyers have the experience, the credentials, and qualifications needed to competently and effectively represent the rights of injured workers in Atlanta. In fact, William Cummings has had extensive experience in the area of workers’ compensation. For years, Mr. Cummings represented employers and insurance companies in workers’ compensation claims, and even worked as a Staff Attorney for the Georgia State Board of Workers’ Compensation, Appellate Division. Tracy Middlebrooks has primarily handled workers’ compensation cases since 1999 and has been a featured speaker and lecturer for a number of workers’ comp-related seminars over the years.